After you’ve sat on it for a few days, you’ll never want to go back to your old way of sitting. Designed by Peter Opsvik in 1979, our Variable balans is the original kneeling chair. 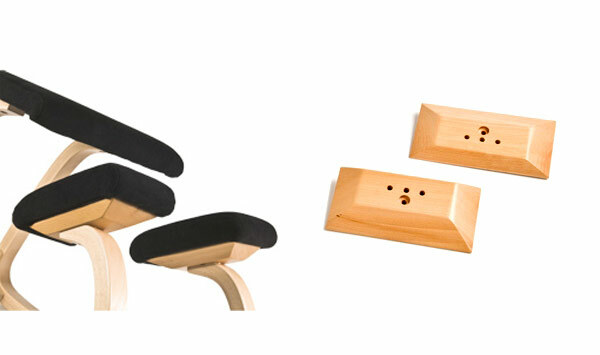 A Varier classic, the seat gently tilts the pelvis forward and encourages a natural, dynamic and upright spine. The muscles in your abdomen and back will engage to keep the spine upright and your body balanced, which further strengthens core muscles and prevents back and shoulder tension. The angle between the upper and lower body increases, which greatly improves your circulation. As the body moves from an active to a relaxed posture, the flexible runners respond with a gentle rocking pendular motion. This 'active sitting' Varier kneeling chair can also be equipped with an optional 'slat' style padded backrest. The Varier Balans Kneeling chair Ships Free. 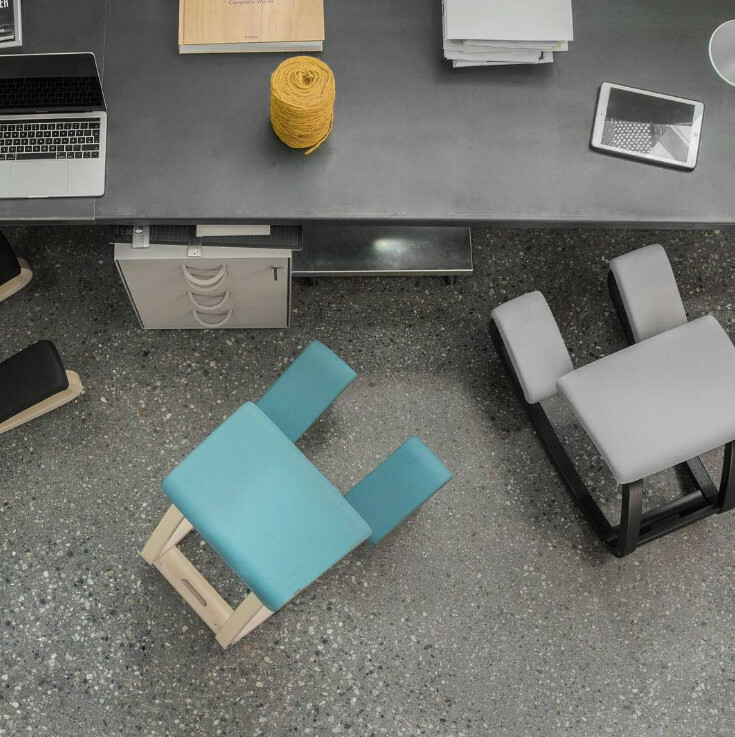 Comment: On the fence about buying a Varier chair? We encourage any hesitant customer by telling them this. Try it out. If you don't like it take it apart and return it to us. It's a slim line box that costs little to ship so returns are not costly. We only ask that while you are testing it out, keep it on a carpeted surface so that the bottom runners are not scratched. We take very few of these back and the retention rate is close to 99% which speaks volumes for how happy our customers are with the Variable. We think you might enjoy one as well. It's a high quality product made in Norway but stocked here in the USA. OfficeChairs USA is an authorized Varier retailer. 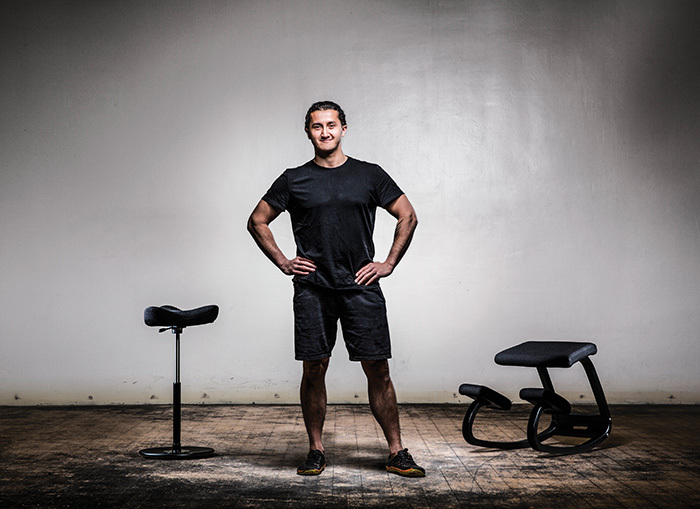 Edward “Coach Eddie” Bergersen is a personal trainer and movement therapist based in Geneva, Switzerland. Movement is life, and to live is to move. As a species, we have become so successful at surviving that we created environments where there is no real need to move. The chair is our new friend, and we go from A to B using machines. Sounds good right? Well, not really. The problem is that our DNA has not, over the course of thousands of years, had a chance to adapt to our modern, sedentary lives. Our physiology craves movement. Simply take one look at the statistics regarding low back, neck, and shoulder pain, and you will see that the cost to society is staggering, and rising rapidly. Sitting has become the new smoking. Gluing our butts to traditional chairs leads to a whole host of physiological problems that include decreased muscular activation in the legs, lowered insulin sensitivity, increased risk of back prolapse due to the stretching of the posterior spinal discs, and disturbed breathing patterns, to name but a few. What we need is movement, and I'm not talking about the frantic Weekend Warrior-ism currently in vogue. No, what we need is a middle ground. Too-little movement leads to tissue stagnancy; muscles shrink and become reflexively tight creating pseudo-stability. Holding bad positions statically for long periods, like sitting hunched over a desk, lead to low-level chronic shear loads across tissues. This creates inflammation and muscle pain; Both of which, you guessed it, aren't awesome. Too-much movement of a very high intensity could potentially damage structures, such as when you break a bone or tear a tendon. Clearly, the path to health is somewhere between the two. The traditional method of tackling this problem has been to either encourage a better posture through improved ergonomics, or to simply get people moving more. The idea behind improving seated posture is to place your joints in a position where they are biomechanically strongest against the pull of gravity, thus lowering the net forces impacting the spine, and hopefully reduce the chance of pain occurring. While optimizing posture is critical, what is even more important is avoiding stagnancy. Simply using the Varier chairs leads to whole host of benefits over normal chairs, and your joints will begin to feel a lot better. Varier Furniture offers an extended warranty to customers who register their products in our product database. The warranty is limited and covers only manufacturing defects and does not cover misuse, normal wear and tear and defects caused by exposure to sunlight. This requires a successfully completed registration of the product in our Extended Warranty database, and that the warranty certificate is submitted together with the original receipt (proof of purchase). Once registration is completed, proof of guarantee will be sent to you via email. Varier Furniture will handle all claims to its products according to current consumer laws, which can vary from country to country. Basically, Varier Furniture does not offer additional rights over and above the current customer laws. Consumer rights, according to the current consumer law, are in addition to the guarantee and are not affected by the guarantee. Cover normal transportation costs for the replacement part or product from Varier to the retailer where the product was purchased. The purchaser is responsible for covering the return costs to the retailer. Reserve the right to replace defective parts in colors that are available at the time of the claim. Reserve the right to deliver a replacement product in instances where the product in question is no longer in production at the time of the claim. This product shall be of the same quality and value. Any queries relating to the extended guarantee shall normally be directed to the retailer from whom the product was purchased. Queries should be raised as soon as possible after detection of the defect. A proof of purchase must always be submitted. If a claim is made under the Extended Guarantee, the registration receipt (proof of guarantee) must be produced together with the proof of purchase. The product shall normally be transported to the retailer or be available for inspection by the retailer or Varier’s sales representative. Photographs and other documentation that document the defect or damage shall be provided. If the retailer is certain that the damage is due to a fabrication fault he shall send the claim to Varier Furniture, together with documentation and necessary photographs. Varier Furniture shall evaluate repair or replacement of the product or replacement of any part due to fabrication error. The cushions will change form following normal use and age. This must not be confused with loss of elasticity which can be attributed to a fabrication fault. The cover (both material and leather) will stretch as a result of normal use. This must not be confused with loss of elasticity which can be attributed to a fabrication fault. Folds and wrinkles may occur and are not grounds for a claim. Lack of cleaning could seriously impact the lifetime of the furniture. Any cover that is a synthetic material (for example, micro fibers) will on movement against the surface of the cushion, generate static electricity. This may prevent the cover reverting back to its original form after rising from the chair. The purchaser may perceive these as wrinkles or folds. However, these are temporary and can be removed by a single stroke of the hand. This must not be confused with loss of elasticity or problems with the shape which can be attributed to a fabrication error.